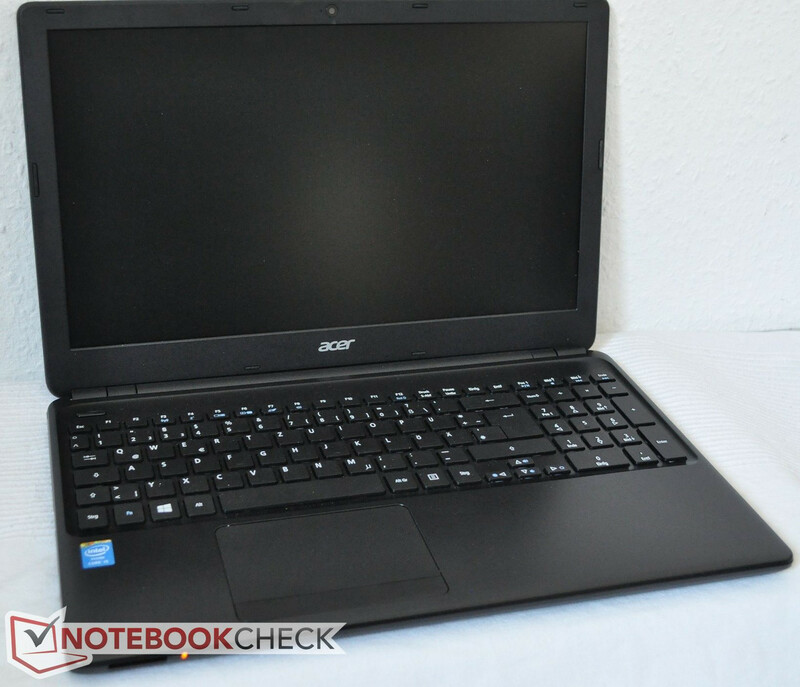 In our review we are going to take a closer look at the Acer TravelMate P255-M-54204G50MNSS notebook. Acer advertises the P2 series with the slogan "Efficient, reliable and green computing". Please read on to find out if the notebook can live up to this claim or not. The review notebook is powered by an Intel Core i5-4200U processor with a base clock rate of 1.6 GHz and a Turbo-maximum of 2.6 GHz. The dual-core ULV CPU is part of Intel's current Haswell lineup. The notebook also sports 4 GB of RAM, a 500 GB hard drive, and a DVD writer. The integrated GPU Intel HD Graphics 4400 shares the main system RAM. Notable differences between the new model and the predecessor Acer TravelMate P253-M are the faster CPU and the more potent graphics card. To evaluate the P255-M, we will not only compare it the older model, but also to the Fujitsu LifeBook A544 (Core i5-4200M / 4 GB RAM / HD 4600) and the Lenovo B5400 MB825GE (Core i5-4200M / 8 GB RAM / Nvidia GeForce GT 720M). The Acer TravelMate P255-M opened. The bottom features a maintenance cover. The Acer TravelMate P255-M comes in a sleek-looking black color. Although the chassis is made entirely out of plastic, the overall appearance is very elegant. Gone are the silver accents of the predecessor. The keyboard tray, the palm rest, as well as the back of the display lid are made from a glossy and smooth material. The case looks upscale and feels good to the touch, although fingerprints are a bit of an issue. The bottom of the notebook is also black, although the material is coarse and not smooth. The competitors LifeBook A544 and Lenovo B5400 are also made out of plastic. The chassis of the P255-M is pretty sturdy overall. Pressure on the left palm rest results in some give and some strange creaking sounds; pressure on the right palm rest results in part of the front and the keyboard bending downwards. With the notebook closed, the back of the display bends inwards as well when pressure is applied, although the flexing is within reason and not accompanied by any unusual sounds. The display wobbles quite a bit when its position is adjusted. Although there are some minor issues, the overall impression of the chassis is a favorable one. Another improvement compared to the predecessor and a step in the right direction is the port selection, as the TravelMate P255-M has finally gained a USB 3.0 port. 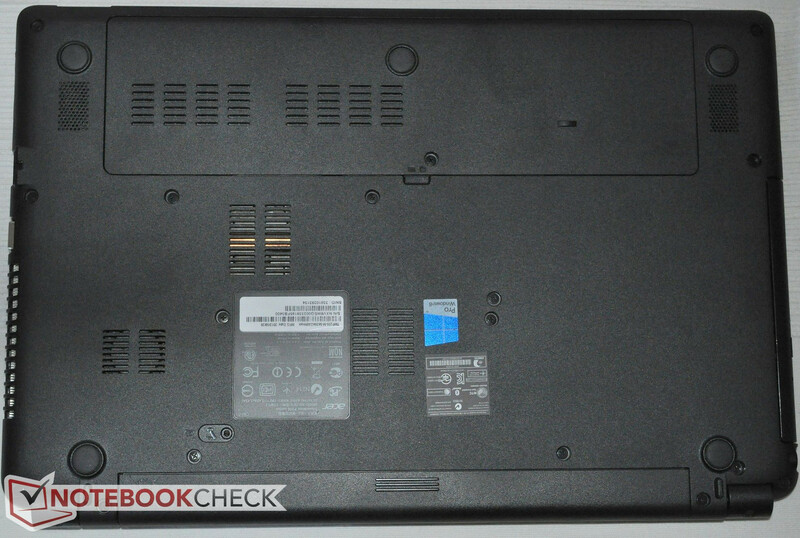 The LifeBook A544 comes with three USB 3.0 ports, however, and Lenovo's B5400 has two. 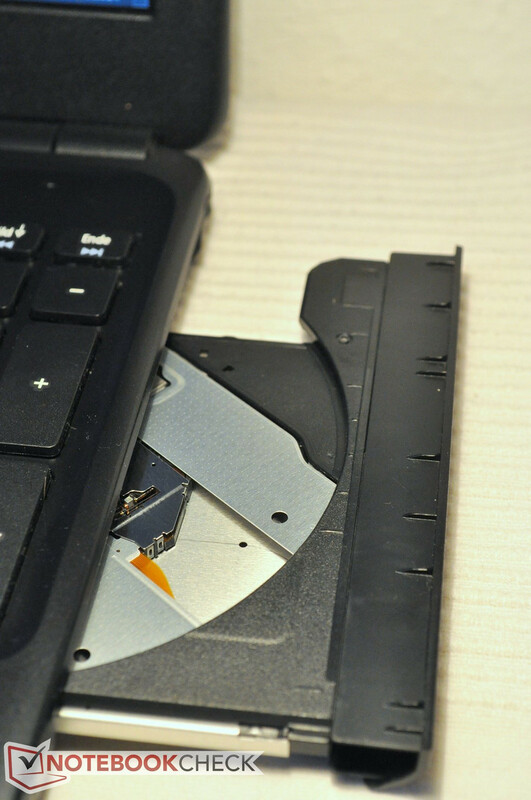 An ExpressCard slot is not included. The right side houses two addional USB 2.0 ports. The WLAN module is from manufacturer Atheros and supports the common standards 802.11b/g/n. Reception quality in our test environment was very good - even 20 meters from our router (model Alice), the connection speed was still a healthy 1.1 Mbit/s. A physical LAN connection - the chip comes from Broadcom - is also on board and supports speeds up to 1 Gigabit. Acer is pretty generous with the communication modules and also integrated Bluetooth 4.0. The predecessor TravelMate P253-M had to make do without. For Skype and other communication functionality, Acer also integrated an HD webcam. The shipping box includes a quickstart guide, a pamphlet for Windows 8, and a (folded) leaflet. The latter explains how to switch between Windows 7 Professional 64 Bit (downgrade option is included) and Windows 8 Professional 64 Bit. 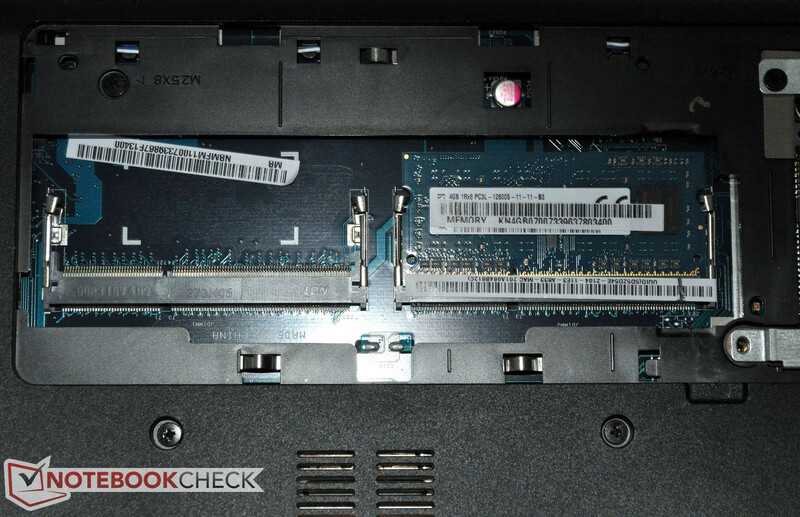 With the maintenance cover removed, the user gains access to the two RAM slots for DDR3 modules. One slot is populated with a 4 GB module, the other is open and can support another 4 GB module for a maximum of 8 GB RAM. 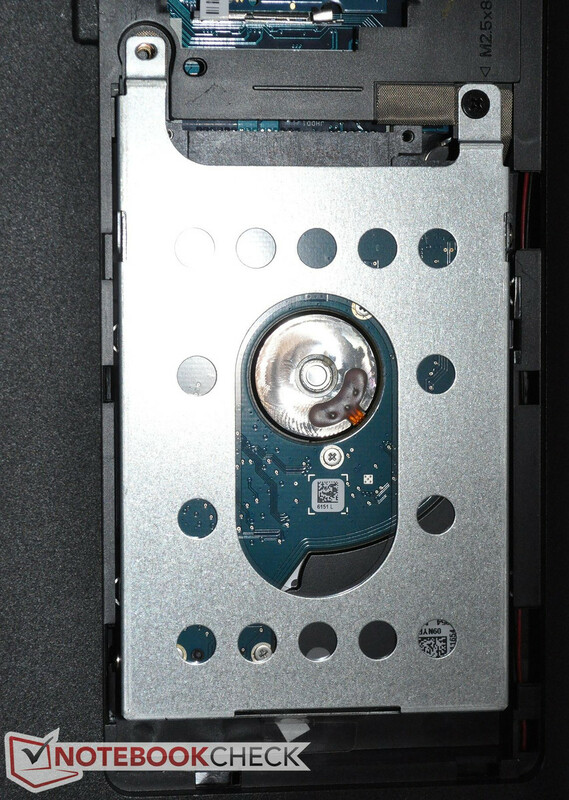 The hard drive is removable is well, but other components are not accessible. 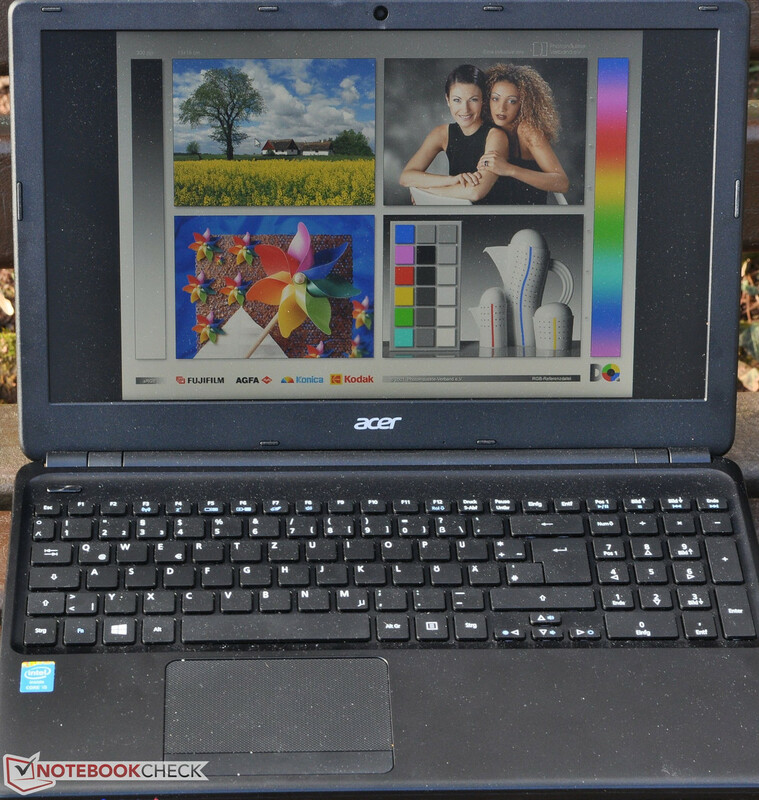 In Germany, the Acer TravelMate P255-M comes with a 24-month "bring-in" warranty, which requires the user to send in the notebook in case of a defect. Acer is more generous here than Fujitsu and Lenovo, since both the LifeBook A544 as well as the B5400 are only covered for 12 months. While the keyboard of the predecessor TravelMate P253-M felt somewhat cramped, the new model has a better layout and the typing experience has improved significantly. The main keys measure 16 x 16 mm and feature a distance of 4 mm between them. The arrow keys are now separated from the main keys and are consequently much easier to use. 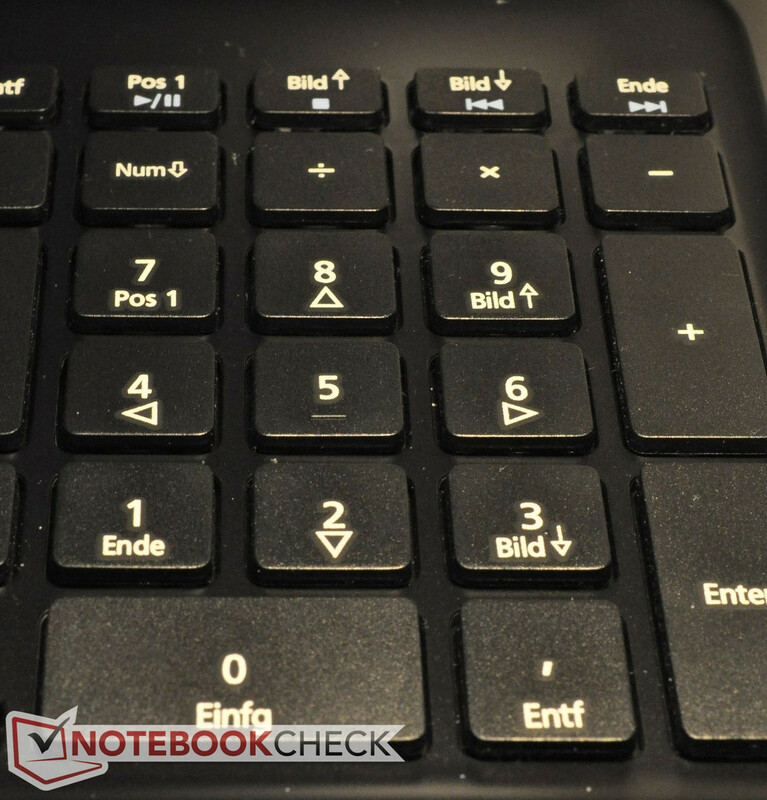 Because of the larger gaps between the keys, typing on the keyboard has gotten much easier. Key travel is adequate and the feedback clear and precise. Overall, the typing experience is comparable to the Fujitsu LifeBook A544, but better than on the Lenovo B5400. The key spacing is generous. The touchpad translates inputs without delays, multi-touch gestures work flawlessly, and we hardly ever had issues with random cursor movements. The rough surface area makes the touchpad easy to use. The two mouse buttons are integrated into a single bar; separate left and right buttons would be easier to distinguish in our opinion. The single mouse button does work well, however: the actuation point is easy to feel and the noise level well controlled. Acer didn't improve the display: the new model inherited the 15.6-inch display with the low resolution of 1366 x 768 pixels from its predecessor. 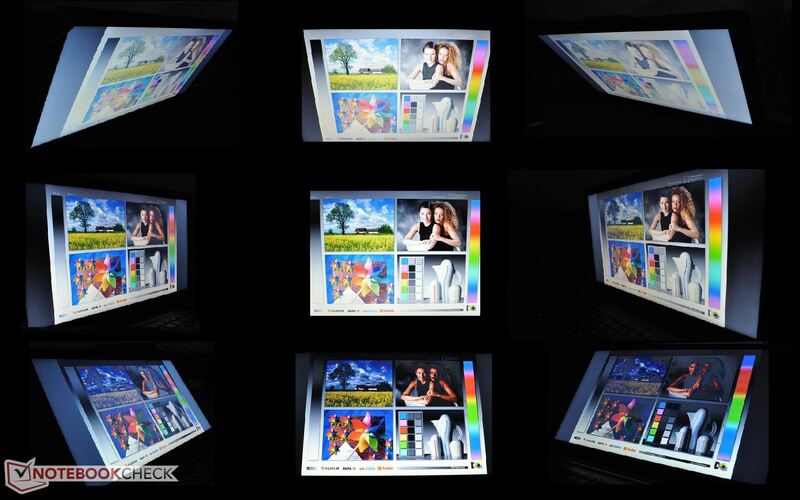 The LED panel is matte and features a 16:9 aspect ratio. Maximum brightness is reduced noticeably: the average of 169 cd/m2 is clearly inferior to the TravelMate P253-M's 211.1 cd/m2. The results of the CalMAN tests for both Grayscale and ColorChecker are not quite as dismal. The Fujitsu LifeBook A544 shows deviations of 6.77 for grayscale and 6.82 for color; Lenovo's B5400 posted scores of 10.13 and 9.13, respectively. For the TravelMate P255-M, we recorded DeltaE(2000)-deviations of 8.1 (grayscale) and 7 (color). The bluish cast of the predecessor has not been eliminated and is still noticeable. The contrast ratio of 264:1 is better than the result of the Fujitsu LifeBook A544, but trails the Lenovo B5400 by a significant margin. The matte display doesn't really have any issues with reflections. The maximum brightness is borderline though and should be a little higher to guarantee better readability when using the notebook outside. The viewing angle stability is quite good in the horizontal plane, but deviations from the vertical axis push the display to its limits rather quickly. Unlike the Acer TravelMate P255-MG notebook, which comes with a dedicated AMD Radeon HD 8750M GPU and is - at the time of writing - less expensive online than our review model, the TravelMate P255-M only has the integrated Intel HD 4400 to handle graphics. 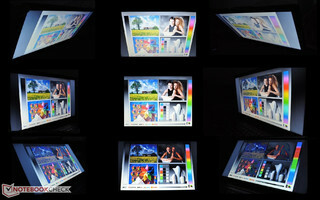 The notebook is thus not designed for high-end photo processing or demanding games. Both notebooks are otherwise identically equipped with an Intel Core i5-4200U processor and 4 GB of RAM. The Acer TravelMate P255-M-54204G50MNSS comes equipped with an Intel Core i5-4200U dual-core processor with a base clock rate of 1.6 GHz. Using the Turbo, the CPU can overclock to 2.6 GHz. The i5-4200U is based on Intel's current ULV Haswell architecture, while the predecessor TravelMate P253 was equipped with a Sandy Bridge CPU. The TDP (Thermal Design Power) of the Haswell CPU is 15 watts. The P255-M ended up with 2.49 points for the 64-bit Multi-CPU Cinebench R11.5 benchmark test - a result which lags behind both the Lenovo B5400 (Core i5-4200M / GeForce GT 720M) as well as the Fujitsu LifeBook A544 (Core i5-4200M / HD Graphics 4600). Those two notebooks utilize standard-voltage processors and garnered 3.27 points (Fujitsu) 3.21 points (Lenovo), respectively. The results of the single-core test of the Cinebench R11.5 benchmark show a similar gap in performance. While the TravelMate P255-M managed to score only 1.0 points, the Lenovo B5400 and the Fujitsu LifeBook A544 reached 1.36 and 1.35 points, respectively. Both competitors come with the more powerful Core i5-4200M. During the tests, the clock rate of the i5-4200U remained at a constant 2594 MHz (single core) and 2294 MHz (both cores). The result of 2374 points for the PCMark 7 benchmark test show an improvement of roughly 15 % compared to the predecessor. The Lenovo B5400 (Core i5-4200M / GeForce GT 720M) earned 2885 points and thus outperforms our review notebook by a pretty significant margin. The TravelMate P255-M handled the various daily tasks like office applications, web surfing, and media playback without any issues. The Seagate Momentus hard drive Acer uses for the TravelMate P255-M spins at 5400 RPM and has a capacity of 500 GB. Of that, 434 GB are user-accessible space, which is more than enough for videos, music, or photos. The new hard drive was able to outperform the (already fairly quick) hard drive in the predecessor. CrystalDiskMark 3.0 now reports 103.7 MB/s (reads) and 99.94 MB/s (writes) instead of 94.74 and 93.62 MB/s, respectively. 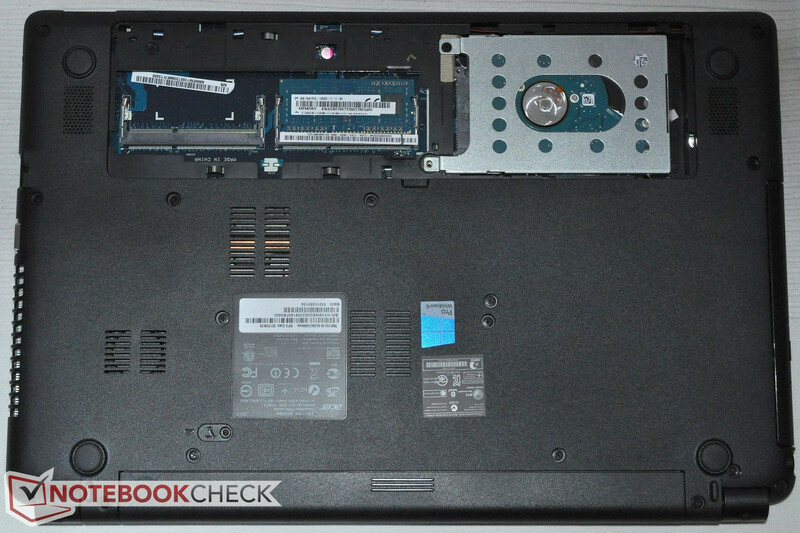 The performance of the hard drive positions our review notebook between the Lenovo B5400 (98.66 MB/s reads, 91.65 MB/s writes) and the Fujitsu LifeBook A544 (106.9 MB/s reads, 105.7 MB/s writes). According to the tool HD Tune, the hard drive in the TravelMate P255-M-54204G50MNSS outperforms those of both competitors. While the predecessor Acer TravelMate P253-M used the Intel HD Graphics 3000, the new model utilizes an Intel HD Graphics 4400. The graphics card operates at maximum frequencies of 789 MHz (GPU RAM) and 1000 MHz (GPU), respectively. Both the Fujitsu LifeBook A544 and the Lenovo B5400 feature the faster Intel HD Graphics 4600, which explains why both modes have an edge when running the 3DMark (2013) benchmark test. 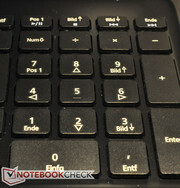 The LifeBook A544 reached 4461 points; the Lenovo B5400 an even higher 4782 points. Our Acer TravelMate P255-M doesn't do quite as well with a score of 3939 points. 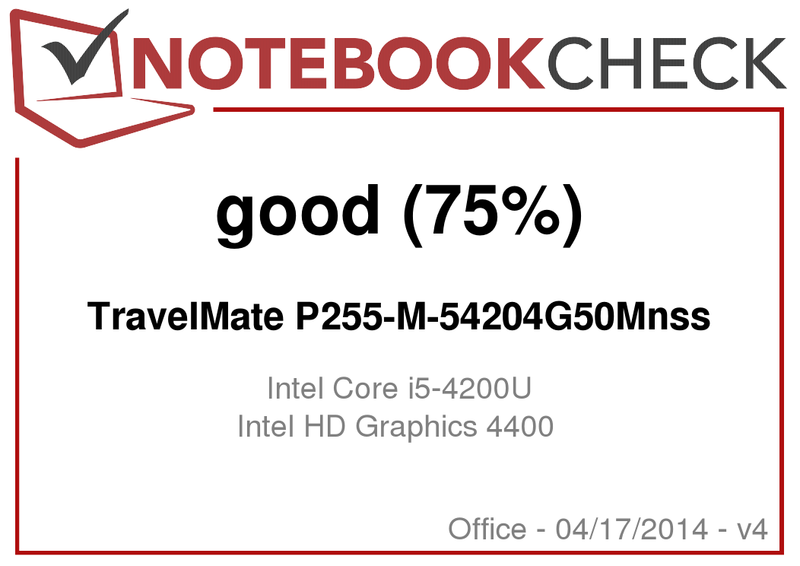 The version of the TravelMate with AMD Radeon HD 8750M GPU (model P255-MG) should be about 75 % faster than the review model with Intel HD Graphics 4400 - at least according to scores of other notebooks with the same hardware. Since a theoretical benchmark test like 3DMark doesn't tell the whole story, we also played a few current games like Tomb Raider, FIFA 14, and Battlefield 4. For power-hungry games, Intel's GPU is just too slow, but a few of the less-demanding games can be played without major problems. As far as the noise level is concerned, we can fortunately report that there are no major changes. During idle, we recorded between 30.8 - 31 dB; when playing back a DVD, the noise level increased to 35.7 dB. Under load (3DMark 06 running) and during the stress test, the TravelMate P255-M reached 34 dB and 36.7 dB, respectively. 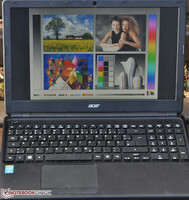 The latter measurement is actually lower than what we had recorded for the Acer Travelmate P253-M. The Acer TravelMate P255-M doesn't run very hot and the temperatures are actually much more moderate when compared to the predecessor. During idle (two hours with maximum power savings enabled), the notebook didn't exceed 27.8 degrees C on the top and 31.5 degrees C on the bottom. Under maximum load conditions (Furmark and Prime 95 running in parallel), the notebook topped out at 34.1 degrees C on the top and 32.1 degrees C on the bottom. This means that the P255-M can be used comfortably at all times even when pushing the performance envelope. During the stress test, the Intel Core i5-4200U reached a maximum of 70 degrees C, while the Intel HD Graphics 4400 leveled of at 68 degrees C. The clock speeds remained at 2294 MHz (CPU), 1000 MHz (GPU), and 800 Mhz (GPU RAM). The stereo speakers are housed on the bottom of the notebook. Small perforations on the left and the right towards the back give a away their location. Since a subwoofer is not on board, bass is pretty much nonexistent. Highs are acceptable, but we recommend connecting external speakers or headphones to the 3.5mm audio jack for better sound quality when listening to music or watching a movie. 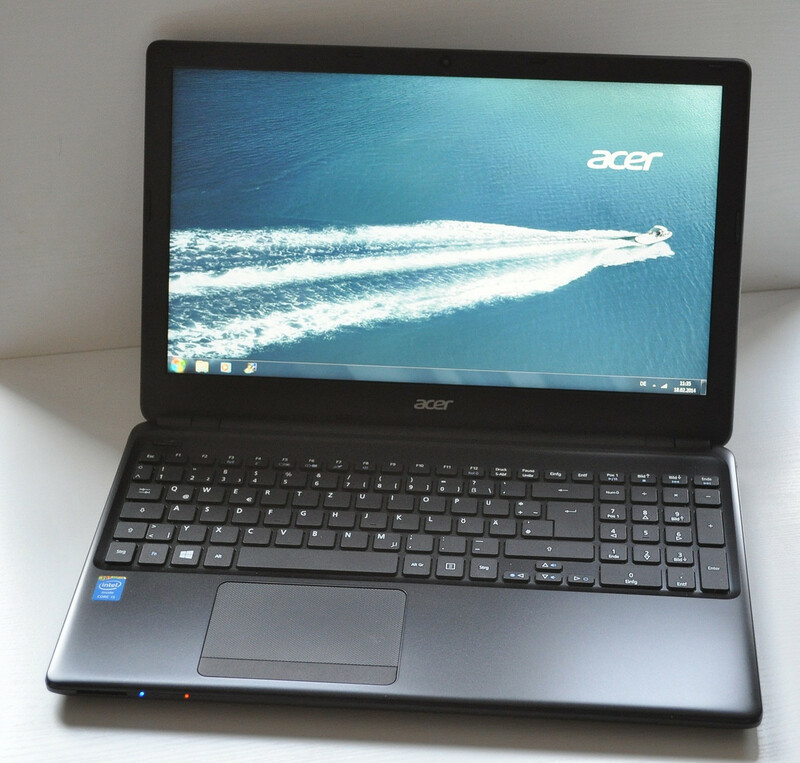 The Acer TravelMate P255-M-54204G50MNSS isn't very power hungry and only requires 4.6 - 8.4 watts during idle. With Prime 95 and Furmark running, we recorded a maximum of 36.7 watts, which is - just like the values recorded during idle - way more frugal than the predecessor TravelMate P253, which had a CPU with a TDP of 35 watts. To determine the battery life during idle, we use the tried-and-tested Reader's test with the power saver profile enabled, all wireless modules off, and the brightness turned down to the lowest setting. The P255-M shut down after 6 hours 29 minutes, which falls a bit short of the 7 hours 11 minutes we recorded for the Acer TravelMate P253-M. For our WLAN test, we use a script which visits a different web page every 40 seconds. The power saver profile is active her as well and the display is set to approximately 150 cd/m2. While the predecessor kept running for only 3 hours, the TravelMate P255 lasted significantly longer at 5 hours 9 minutes. For the targeted user group - business users with a tight budget - both the very decent keyboard as well as the battery life are definite plus points. 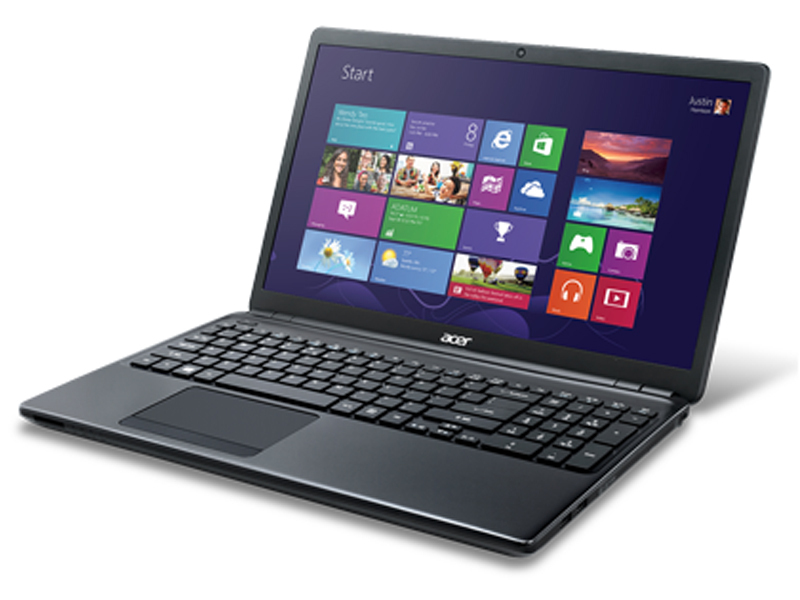 The Acer TravelMate P255-M is also powerful enough to handle the daily web surfing or HD movies. For demanding games the GPU is simply not powerful enough. The less expensive Acer TravelMate P255-MG not only has better graphics performance, but also saves the user a few bucks. The display has some flaws as far as its brightness, contrast, color reproduction, and viewing angle stability is concerned. The sound system is also nothing to get too excited about. Aside from that, the notebook is quite suitable as a daily companion for those users who need to type a lot or like surfing the web. A DVD burner is also on board. The keyboard has a seperate number pad. The 4 GB RAM chip is easy to access. Under the maintenance cover: the hard drive with a capacity of 500 GB. The bottom of the TravelMate P255-M with the maintenance cover removed. The keyboard is perfectly suited for office-type tasks and the system is pleasantly quiet overall. Even the successor of the TravelMate P253-M didn't get an upgraded display panel. Acer's 24-month warranty coverage is a commendable good argument for a purchase.